Bacardi Mama: My House is Going on a Diet! I'm not the only one in this house thinking about scaling down in 2013. My house is going to scale down as well. My house is going on a diet! I don't know about you, but my house has more clutter than it needs. Working full time gives me not a lot of time to declutter. It's easier to just keep moving things around instead of finding them a permanent place or getting rid of them all together. I've known for some time now that this problem needed attention, but my attention has been elsewhere and everywhere but there. Enter my buddy, Christie! She posed a question on Facebook the other day. What do you need more in your life? Motivation or organization? Well, that's a poser. I need them both, but organization would be awesome. 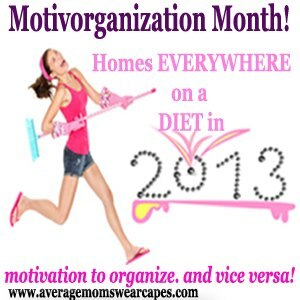 If I was organized, possibly I'd be more motivated. So, awesome person that she is, Christie ran with the idea and enter Motivorganization Month! This makes me so happy. She is giving me organization plans and skills and motivating me all at the same time. She is doing this with the help of Fly Lady. I am going to spend the next hour or so, reading what I need to do and make a plan of attack. This really excites me. My house deserves this revamping. She serves us well and I need to be better to her. An organized house is a happy house, right? I took a tiny step in the right direction tonight and cleaned out the junk drawer in the kitchen. One small, but huge step. You wouldn't believe the things I found in there. Why did I feel the need to save 47 twisty ties? I'll be checking back in once a week to show you my progress and what I'm doing. You can join us, you know. Is your house "morbidly obese" as Christie put it. Go check out the link. It may be just what you are looking for. It sure is what I need. My problem with my house is, my husband is a pack rat. He collects and saves things and dust is growing around his model airplanes that he builds and the die cast cars in boxes he collects. It looks like a hobby shop in certain rooms in our house...I hate clutter and love to throw or give away. Now, if I can talk him into decluttering we would have it made.